From left, Rodrigo Werle, assistant professor of agronomy and horticulture; Jacob Nickel, irrigation research technician; and Himmy Lo, research assistant in biological systems engineering, perform stalk nitrate sampling on a plot at the West Central Research and Extension Center in North Platte, Neb. LINCOLN, Neb. — A new University of Nebraska-Lincoln-led partnership is helping agricultural producers explore emerging technologies and identify ways to strengthen profitability without increasing risk during the growing season. 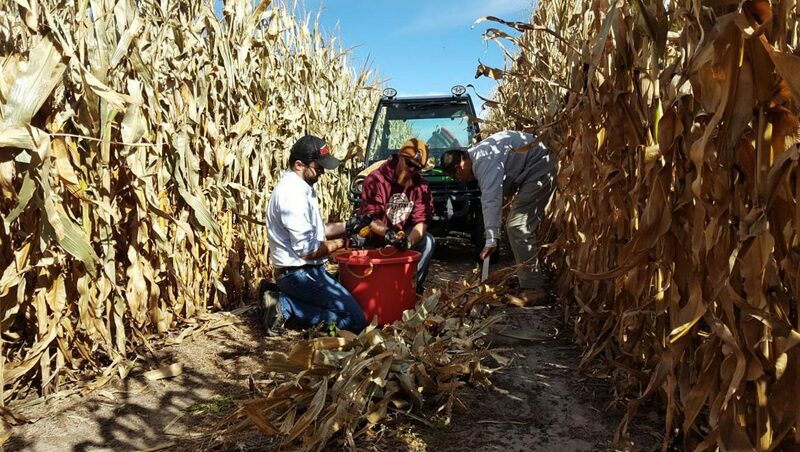 Organized by Nebraska Extension and the Nebraska Water Balance Alliance, the UNL Testing Ag Performance Solutions farm management competition involved managing center pivot-irrigated corn. Seventeen producers squared off against university scientists and two student groups in three categories: most profitable farm, highest input use efficiency and greatest grain yield. 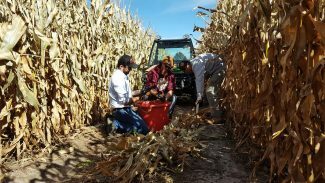 "We came up with the idea for the UNL-TAPS competition as a way to help producers become familiar with new ag technologies and techniques, while also leveraging a peer-to-peer exchange of information," said Daran Rudnick, assistant professor of biological systems engineering and agricultural water management specialist with Nebraska Extension. The competition took place at the university's West Central Research and Extension Center in North Platte. Each participant managed three small plots under a variable rate irrigation system. Pre-season decisions included hybrid selection, population density and crop insurance selection. Each week, participants made decisions regarding irrigation and nitrogen management, and grain marketing. Decisions were submitted through a password-protected website, which also included in-season photographs of the plots, weather data and additional farm management resources. "With today's low commodity prices, we really wanted to focus on profitability," said Chuck Burr, an Extension educator. "It's not just about highest yield; it's about highest economic yield, meaning at what cost did it take to achieve a certain yield." The competition attracted the attention of several industry partners, who were curious about the management practices being used. The industry representatives were able to share information about their new technologies with producers. John Walz who owns and operates a farm 22 miles north of North Platte, participated in the competition because the knowledge needed to manage an operation is constantly expanding. "I've really learned a lot by participating in the UNL-TAPS competition," he said. "There were a lot of really cool tools at our disposal, and we've had the opportunity to see if they can add value to our operation without risk." Some of the participating producers implemented the same management practices they use on their farms while others used the competition to evaluate different practices. Not only were producers able to expand their knowledge, but the contest allowed Nebraska Extension to expand its expertise. "We recognize that the university plot might not be the most successful one in the group, but that provides a great learning opportunity," Rudnick said. "It's critical for us to understand different management practices that take place on individual operations so that when a grower comes to us and asks 'Why?' we have actual scientific background on why that outcome took place." Cash prizes will be awarded to the top-performing producer, excluding university scientists, in each category at a Dec. 12 awards banquet. In the coming weeks, each producer will share their management strategies and discuss their successes and challenges during educational workshops. Others involved in launching the competition were Matt Stockton, associate professor of agricultural economics, and Rodrigo Werle, assistant professor of agronomy and horticulture. The competition is supported by Nebraska's Natural Resource Districts, the Nebraska Corn Board, AquaMart and several industry partners.